Citation Information: JCI Insight. 2018;3(18):e121560. https://doi.org/10.1172/jci.insight.121560. Stroke triggers a complex inflammatory process in which the balance between pro- and antiinflammatory mediators is critical for the development of the brain infarct. However, systemic changes may also occur in parallel with brain inflammation. Here we demonstrate that administration of recombinant IL-33, a recently described member of the IL-1 superfamily of cytokines, promotes Th2-type effects following focal ischemic stroke, resulting in increased plasma levels of Th2-type cytokines and fewer proinflammatory (3-nitrotyrosine+F4/80+) microglia/macrophages in the brain. These effects of IL-33 were associated with reduced infarct size, fewer activated microglia and infiltrating cytotoxic (natural killer–like) T cells, and more IL-10–expressing regulatory T cells. 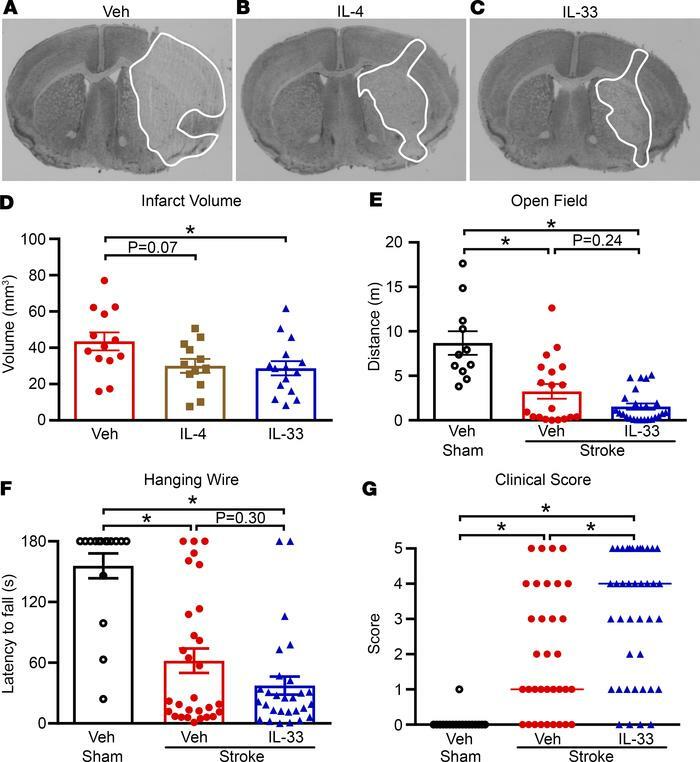 Despite these neuroprotective effects, mice treated with IL-33 displayed exacerbated post-stroke lung bacterial infection in association with greater functional deficits and mortality at 24 hours. Supplementary antibiotics (gentamicin and ampicillin) mitigated these systemic effects of IL-33 after stroke. Our findings highlight the complex nature of the inflammatory mechanisms differentially activated in the brain and periphery during the acute phase after ischemic stroke. The data indicate that a Th2-promoting agent can provide neuroprotection without adverse systemic effects when given in combination with antibiotics. Infarct volume and functional outcome. Representative coronal brain sections from mice treated with (A) vehicle (Veh), (B) recombinant IL-4, or (C) recombinant IL-33 after stroke (infarct areas are outlined in white). Total infarct volume (D), open field performance (E), hanging wire latency to fall (F), and clinical score at 24 hours after stroke (G). Data are presented as mean ± SEM in D–F and as median scores in G. *P < 0.05, 1-way ANOVA with Bonferroni’s post hoc test for D–F and Kruskal-Wallis test with Dunn’s post-hoc test for G. Infarct volume, n = 12–15; open field, n = 11–24; hanging wire, n = 12–29; and clinical score, n = 18–40.